Built by one of the 'lighthouse Stevensons' in 1846 and, sadly, closed in 2006 to be replaced by a buoy. As part of Cromarty's contribution to the Highland Year of Culture 2007, this compilation of interviews, reminiscences, poems and children's drawings reflects what it means to 'live by the sea'. The accompanying book is out of print. Copies are available at Highland Council libraries. Today, Cromarty Harbour is home to commercial fishermen, leisure craft, the Cromarty Queen four-car ferry, the EvoVenture RIB and visiting yachts. 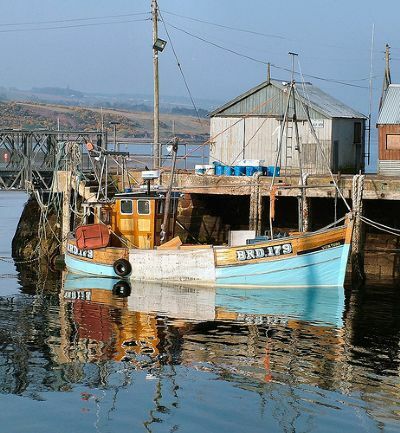 This website gives details of the facilities provided by the Harbour and information on the activities of the Cromarty Harbour Trust. The MV Renfrew Rose operates a half-hourly service between Cromarty and Nigg, leaving Cromarty on the hour and half-hour. The service will run from 1 May until the end of September. The ferry accommodates two cars and 12 passengers. For 'live time' shipping movements in the Cromarty Firth, check this website which gives details of (large) individual vessels, including name, location, speed, destination and ETA. Locals and visitors alike enjoy watching the parade of cruise ships that visit the Cromarty Firth from March to September. The size of vessels ranges from the windjammer Sea Cloud 2 with 85 passengers to the new MSC Meraviglia with 4500. News of boating (sail and power boats) activities and competitions, social events and facilities offered by the Club based at Cromarty Harbour. Since 1990, the Lighthouse Field Station has provided a Highland base for the Institute of Biological and Environmental Sciences' research and teaching on the ecology of seals, dolphins and other marine wildlife.